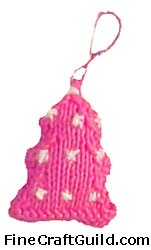 Knitting these lovely knitted Christmas tree ornaments has been fun. Or, use them as ornaments, or as can brooches to dash up that favorite sweater. Or, they can be key chain tags. They can even be used to beef up your gift tags. 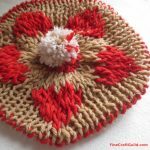 These free knitting patterns are for beginning knitters, and of course can be made by the rest of us also. If you are a beginner in knitting, then check our GLOSSARY WITH KNITTING ABBREVIATIONS so the patterns below make sense to you. 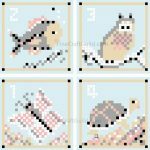 Here are 4 Christmas ornaments to knit. I made pink & purple versions of existing Christmas ornament patterns. If you choose traditional Christmas colors for these ornaments, like that very dark green and red, they will have an old-fashioned look to them. Don’t go there. 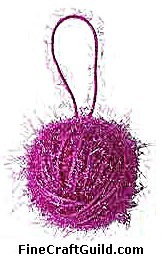 Instead, go with something funky, like mauve, pink, violet, purple, silver…., like I did for all of them, and choose interesting yarn, like we did for #3. 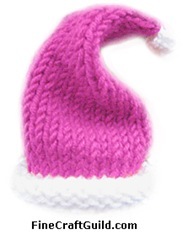 A remnant of knitting yarn; we choose pink, but you can choose your preferred color. If you want a traditional look, use either dark green, red or white. A tiny biti-bit of knitting yarn of brown yarn for your tree trunk. Another tiny bit of any kind of yarn of a nice contrasting color. Or: choose sequins, embroidery yarn, or seed beads to make tiny ornaments in your knitted Christmas tree. A remnant of batting or textile scraps to stuff your pillow. 1 pair of needles (US-size 7). Begin at the bottom of your tree by casting on 15 sts. Rows 16 & 17: Repeat rows 2 & 3. Repeat the above to knit the other side of your Christmas tree. Hand-embroider your Christmas tree with ornaments, icicles, stars, or beads. You can do just the front or both sides of your Christmas tree. Sew the 2 sides of trees together but leave the tree bottom open. Fill your tree with the batting or textile remnants and sew your tree bottom. For your Christmas tree trunk, using brown yarn, cast on 4 sts. K 2 rows, bind off. Sew the narrowest side of the trunk to the bottom-center of your knitted Christmas tree. Stuff your tree tree first. Sew on a hanging loop at top of tree ornament. Choose the same knitting yarn as your tree, or a contrasting, pretty shiny ribbon. Source:allfreecrafts.com (thanks), but designed by frugalhouse.com. Is this cute, or is this cute? It’s part of a set of 12 mini sweaters. There are actually 2 sets of miniature sweaters, so if you like making this tiny sweater, you could make an advent calendar out of your 24 mini sweaters next year. Save time and check gauge when you begin. Row 1 (RS): P3, k8, p3. Row 2 and all WS rows: K3, p8, k3. Row 3: P3, CB8, p3. Rows 5 and 7: Rep Row 1. 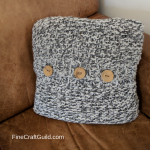 With straight needles, cast on 16 sts. Knit 1 row. Inc Row (RS): K3, place marker, p3, (k1, M1k) 4 times, p3, place marker, k3 – 20 sts. Following Row (WS): P3, k3, p8, k3, p3. Beg with Row 1, work even in Cable Pat, keeping 3 sts at each side in St st until piece measures 2” from beg, end on WS. Mark beg and end of last row for beg of armholes. Dec Row (RS): SSK, work to last 2 sts, k2 tog – 18 sts. Work even in pat as established until piece measures approximately 2 ¾” from beg, end on Row 8 of Cable Pat. 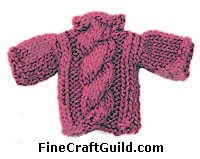 Shoulders and Neckband: Next Row (RS): Bind off 4 sts, dropping marker, work in pat as established to end – 14 sts. 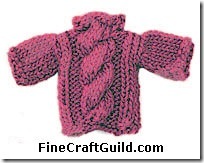 Following Row (WS): Bind off 4 sts, dropping marker, work in pat as established to end – 10 sts. Knit 2 rows, end on WS. Bind off. Work same as back. Sew shoulder seams and sides of neckbands. With RS facing, using straight needles, pick up and k14 sts between markers. Beg with a p row, work even in St st for 1 1/4”, end on WS. Knit 2 rows. Bind off. Sew side and sleeve seams. .. Small amount of any kind of yarn . 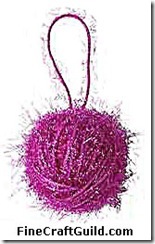 Or, if you want it fluffy like I have here, try this fun fur yarn . 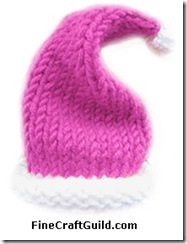 Well, this ornament is kind of a cheat: there is NO KNITTING…. just winding… To create this ornament, all you do is wind a ball of fluffy yarn such as these to approximately 3.5” and weave in the end. Done. Either tie on a loop or a shiny ribbon to hang your ornament in the treat. Great ornament to make with the kids. Very easy, very fun, very fast. Time to complete: < 1.5 hrs. The first one takes most time, the following ones go faster. Using white yarn, cast on 30 stitches and divide evenly over 3 dpns. Join and knit 8 rows in white (add rows if you need to so it forms a nice roll brim). Change to red yarn and knit 12 rows. Begin decreases: Knit the first two stitches on each needle together. Repeat these two rows until you only have 3 stitches left. Tie them off. Start with a slip knot of white yarn on a single needle. Knit in the front and back of the stitch, increasing to 2 stitches. Knit in the front and back of both stitches, increasing to 4 stitches. Repeat once more for a total of 8 stitches. Begin decreases: Knit two together across, decreasing to 4 stitches. Repeat, decreasing to 2 stitches. Repeat once more and tie off. Pull the two ends together and shape a little ball. With a darning needle, thread the ends through the top of the hat and tie a knot. If you want your hat to hang straight, string it up from the top. If you want it to have a little curl, like mine, string it up from the middle. Great knitting ideas. I would love to become a better knitter. I find it relaxing. I especially like the ball. Very fun. Thanks for linking to Poppies @ Play!